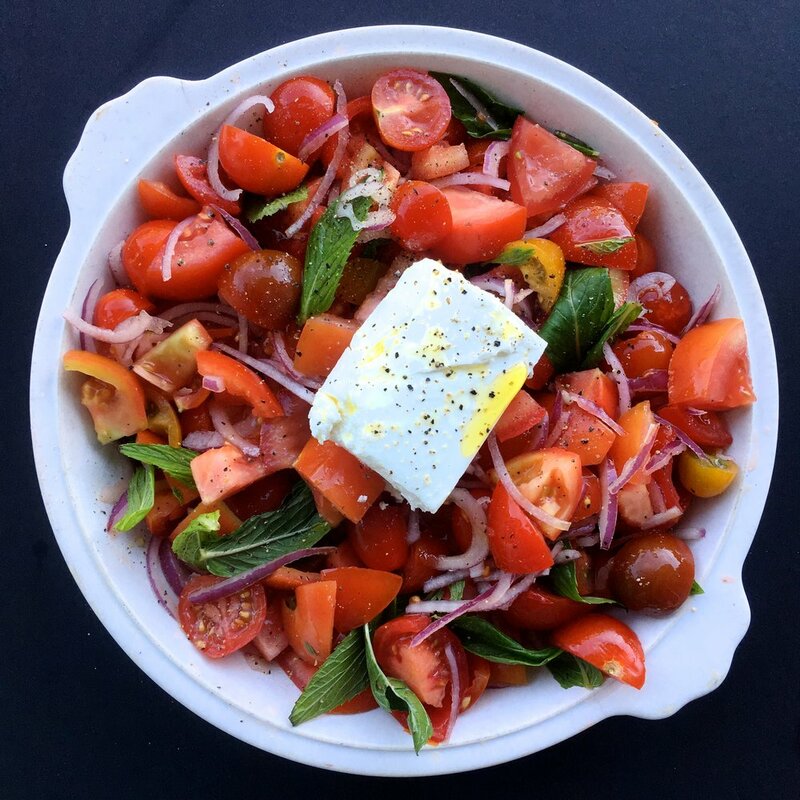 Tomatoes are at their best during Spring and Summer and this simple 4-ingredient Tomato and Feta Salad is a winner, especially for BBQ season. Tomatoes are loaded with Lycopene, a really impressive antioxidant that gives tomatoes their red colour and helps protect your skin from the sun (and has been linked with reducing risk of heart disease and some cancers). Seriously, who needs superfood when you've got tomatoes? Skip the hype around superfoods. Fruit and vegetables are the real health food heros. You don't have to use heirloom tomatoes for this salad - a mix of cherry and those big plump (cheaper) tomatoes will do the trick. I get the tomato medley mix (it's got yellow, orange, green and red tomatoes) because I think they look pretty so I'm always grabbing them when they're in season. You can also serve this salad with tacos as a salsa or add cucumber and olives for a beautiful Greek Salad. I'd serve with with just about anything (I'm easy like that!) but it'd go wonderfully with BBQ chops, chicken, falafels or grilled haloumi. Tip: If you get heart burn, make sure you don't have this kind of salad too close to bed (give at least 3 hours) and don't lie down soon after eating. Chop tomatoes and slice red onion. Place in a bowl with mint leaves and toss. Top with a wedge of feta, a crack of pepper and serve with caramelised balsamic (balsamic glaze) and extra virgin olive oil.